Home / Fanboying! / Rant! Mark Hamill Leads Charge Against Fake Autographs But Doesn’t Use The Force To Sign Real Ones! Hypocrisy! Rising Rates! Rant! Mark Hamill Leads Charge Against Fake Autographs But Doesn’t Use The Force To Sign Real Ones! Hypocrisy! Rising Rates! Mark Hamill recently went on the attack against forged autographs on twitter! It’s taking over the Internet as Hamill informs worried fans on their prized pieces. Now, while its a great forum for Star Wars fans to have a chance to learn about their item’s questionable authenticity, it definitely calls for a different discussion. It was only two weeks ago when Mark Hamill made comments on his lack of signing autographs at a recent Star Wars premiere. He cited the lack of signing due to autograph dealers looking to turn a profit. He continued by claiming that he doesn’t personalize as people can remove a personalization and that dealers gouge fans with high prices. Now, this is where I find the whole thing humorous. Mark Hamill is leading a crusade against fake autographs, however he will not take the time to sign real ones. First of all, Mark Hamill is very well known for being a tough autograph to obtain for free. He has carried the same practice for a while, and I do believe he is being truthful citing ebay as the reason. The Star Wars premiere is a great example. He would not sign at the premiere because he doesn’t know who the “true fans” are. Now, some of those Star Wars fans waited for days. I mean days, camping on Hollywood Boulevard for a chance to get Luke Skywalker to sign their Star Wars item. What does a fan look like? 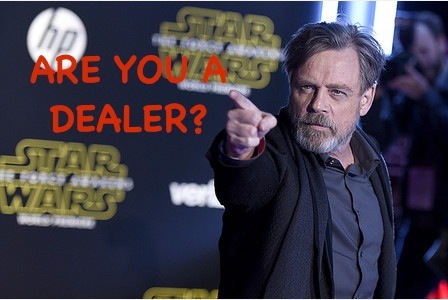 What does a dealer look like? How can you tell the difference? And does it really matter? I am going to go out on a limb to say the majority of those people who waited are fans. Let’s say that one percent of those people were dealers. There were thousands of fans at that premiere. It’s silly to avoid signing an autograph because of the dealer that could be lurking in a crowd of hundreds. Think about the numbers of fans that could have been made happy. To disappoint a bunch of people because someone is concerned of others making a hundred, two hundred bucks at most is rather interesting. Ultimately, brings me to my next point. At the last Star Wars celebration, there was a price tag of $125 to get an autograph from the famous actor. Rumors are there will be a price spike at $175-$200 at the next celebration. Now, Mr. Hamill, who is really gouging fans? Look. Celebrities have the right to do what they please. They are people too. 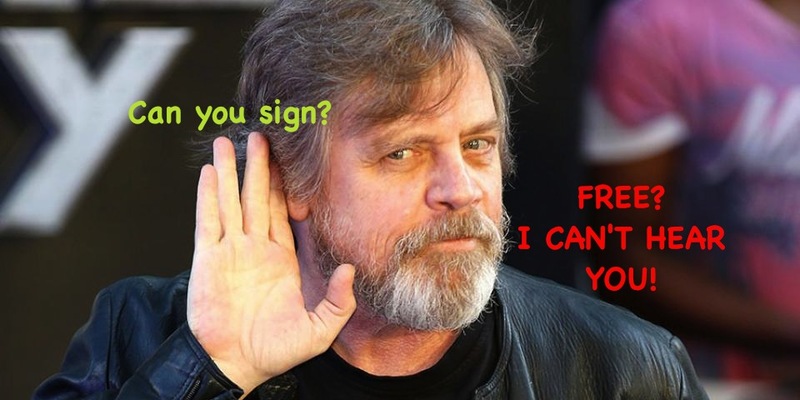 Hamill has the right to sign or not sign. What is a reasonable price? $125? $175? $200? It doesn’t bother you when those hardworking fans line up at a Star Wars Celebration. However, maybe you can think about it the next time a fan approaches you. The next time you decide to lay down in the back seat of your car while trying to avoid the 9-12 people waiting for you at say a small event like the Silent Movie Theater here in LA. Or maybe you won’t laugh about the five fans asking for your autograph at a Laemmle theater in North Hollywood, where your wife exclaimed “made a clean getaway” while chuckling and getting into her car. Those are just two examples of times when you could have easily signed. But wait… They might not be “real” fans. The kind of people who collected Star Wars toys since they were kids. Who can quote a line at the drop of a hat. The kind who are wearing a Star Wars shirt as we speak. Yeah… Couldn’t be “real” fans could they. Personally, I wouldn’t wait a minute trying to get your autograph. Unfortunately, my brother and friends have tried. I feel for them and others like them. And overall, who cares if you sign for a “dealer” at least THAT autograph will be put into the hands of “real” fan at some point. Oh wait… You’re not getting the 125 bucks. I’m sorry Mark. Who should I make that check out to? H-A-M-I-L-L? SDCC! Super Mansion Debut! Bryan Cranston! Seth Green! Photos! Signing! And More! Jekyll or Hyde! Connie Britton! Susan Sings A Sad Song But Eventually Meets The Nashville Starlet! Autographs! Fan Photos! Say Wha? Who Is This Person! One Direction: This Is Us New York Movie Premiere! 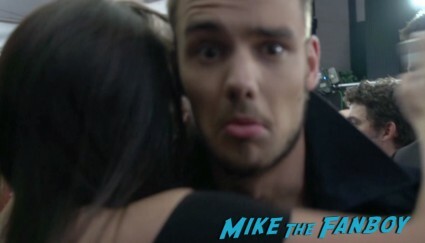 Liam Payne! Zayn Malik! Louis Tomlinson! Niall Horan! Harry Styles! Photos! And More! I’m glad I got mine for $20 in 1995! Anthony Daniels was ahead of Hamill years ago, and possibly still, using his website to note fake autographs. Like Hamill, he’s a tough one too. I personally would like to see a concusses between actors perhaps, where they do a “photo op only” policy if they don’t trust who they sign for. But I don’t think we’ll ever see that because the ones who don’t want to do anything at all would be figured out for not wanting to do even photo ops. You’d figure Hamill would have an online store where people could buy his autograph; he can certainly afford to have someone maintain it. He can even take a page from J.K. Rowling and have a special holographic sticker next to the signature to verify authenticity. I know right. Then maybe he wouldn’t charge so damn much at conventions! i got him loads for free back in the day. in 2001, a couple of us needed him on a LOT of items and offered him basically $75 a signature.. he told us he doesn’t take money for his signature. .. flash forward to a couple of years later when he was charging like $80 at san diego comic con… i ran into him in a green room and told him about what he had said in 2001… he told me “when these people are throwing PILES of money at you, and you aren’t working.. there becomes a point where refusing is downright stupid.” and he still signed a few for me for free.. and he did a panel at that same comic con and signed for free AFTER the panel. he’s always been championing the “don’t buy fakes, put the forgers out of business.” motive. but yeah, it’s hypocritical to not sign at all, then take $125 a pop. also, have you ever tried to take a personalization off a mark hammill signature? he writes SOOOO hard into the photo that it leaves an indentation that won’t go away AND, you can’t take a sharpie’d personalization off a poster (silver, yes. but be careful. ).